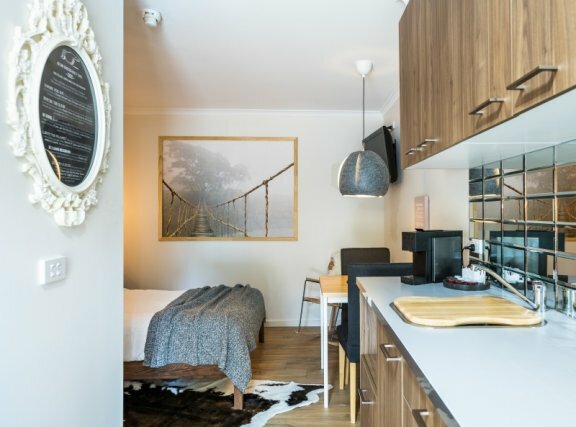 Recently renovated and thoughtfully furnished, our 20 sqm budget studio unit is perfect for one to two people to live comfortably. Modern space with well equipped kitchen, built-in-storage, ensuite bathroom and a furnished outdoor space make this compact unit a comfortable living environment for short-term accommodation. Laundry facilities onsite are well managed and include coin operated washers, dryers and clothes lines. Located in the McMillan Gardens complex on McMillan Crescent in Griffith ACT. Griffith borders Manuka and Kingston, is a seven minute drive to the CBD, 10 minutes to Woden and 20 minutes to Tuggeranong and Belconnen. Canberra’s favourite restaurants, cafes and fresh food markets are only minutes away. Griffith is one of the most prestigious suburbs in Canberra’s Inner South, so you are amongst good neighbours. This really is location, location, location for those on a limited budget. We’d love to have you stay with us. Click here to check availability or book online. This studio unit is so brand new we haven’t even received any reviews on it yet. Will you be the first?